This past week I have been an observer of one man dream’s coming to fruition, and one team heading in the direction of their dreams. Who would have thought that a man which almost quit poker could become the World Series of Poker Main Event Champ? Who would have thought that one of the worst football franchises could be having a dream season with a backup quarterback and individuals severely injured or out at their positions. I am talking about Martin Jacobson and I am also talking about the Arizona Cardinals. 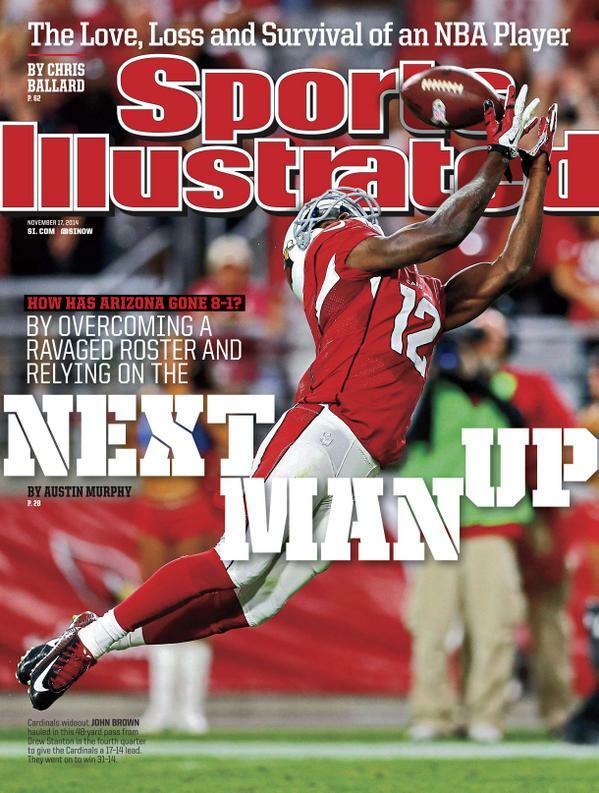 Martin Jacobson was the next man up for the Poker Championship and the Cardinals are relying on the Next Man Up philosophy to pave the way to be the first team ever to play in a Super Bowl in their own city. I can’t help but get energized by these two stories. Thanks to my wife, who is an angel, I was lucky enough to be able to attend and watch the World Series of Poker Main Event final table in person. To see one man win $10 Million playing a game of cards is indescribable. Some would say its just dumb luck, but others who know better (I include myself in this category), realize that there is a reason some folks can make millions of dollars consistently beating the game while others can’t find a way to win under almost any circumstances. As for the Arizona Cardinals, there is not that much talent difference between the worst team and the best team in the NFL. Don’t believe me?? How can a team that has been so bad for so long bring in a coach and 2 years later be the best team in the league. It’s all about attitude and desire. The attitude to believe it can be done under any conditions and the desire to do it on a team level even with some bench players. It’s the next man up to play that has to deliver the effort of the starter so they can participate in a team effort to continue the win streak. It’s not about one individuals efforts, its about team wins under adverse conditions. This is the attitude that Bruce Arians has brought to the Valley of the Sun. If you ever wonder how coaches can be fired when they don’t play the game, the Cardinals are showing you why. A good coach creates a great team. Just ask Phil Jackson who teaches his team meditation and visualization. There is a reason he is thought of as one of the best coaches ever in the NBA. So as I see it, it’s my turn. It’s my dream that is due to be fulfilled with enough effort, attitude, and determination. I AM the Next Man Up. Smiling Big and Dreaming Bigger all the way to the Main Event Final Table. Look for me soon on an ESPN poker broadcast near you. After going to Vegas this Summer for the World Series of Poker I was feeling that I had honed my tournament skills and was really excited about the possibility of playing in this years Arizona State Poker Championship. The buy in was $1,100 which I didn’t want to lay outright. So I decided to try and win my way in, first with a Mega-Satellite in which they give out 1 entry for every 10 people who play. I was doing great and playing great. In this one, they were giving out 14 entries since 140 people signed up. I was getting short stacked as we got down to 19 players and was feeling really nervous. Getting this far and not winning my entry would be crushing. I was short stacked to the point of needing to push all in with any hand that contained an Ace. So I was in early position and looked down and saw my ace; when I was about to say all in, I of coursed looked at the next card and wouldn’t you know it, another Ace. I quickly pushed All In and the guy after me who had a few more chips than I, thought about it for at least a minute and a half before calling with Jack-Nine suited. I won’t draw out the story since most people hate to hear bad beat stories. Basically, I got knocked out when he hit his straight on the river. Was I extremely disappointed, absolutely! I did, however, decide I was going to enter a two win one table satellite the weekend before the tournament. This is a $200 buy in where they play down to 2 players who each get their entry. It was a grind and a battle but I won my entry. I was extremely excited and called my wife and plastered it all over Facebook to let the world know I had won my entry and would be playing in the event. I got into the event and it played out very similar to the Mega-Satellite. I was playing great but seemed to be short stacked most of the day. After playing about 8 hours of tight yet aggressive play, which is a very solid strategy, I looked down and saw Ace – King. For those of you who are not poker players, this is the best hand which doesn’t contain a pair. So I raise because I have enough that I can play a couple of solid hands without having to go All-In. The aggressive professional poker player Matt Affleck decides to re-raise me in hopes to get me off the hand. It folds around to me and I think for a minute to decide whether I should make my stand here or try and play on with an extremely short stacked. For most players it would be a no brainer to go All-In but I happen to be a damn good short stack player. In the end, I decided to go All-In and risk it. Mostly because I figured Matt was being aggressive as usual and most likely had a worse hand than me or a small pair which would make it a coin flip. Turns out, he had Jack – Queen suited and I liked my chances. To make the story short once again, he hit a Jack on the flop and knocked me out. All any player can really do is get their money in with the best of it and hope the better hand holds up. In this case it didn’t and it took me a few weeks to get over this beat. To rub salt in the wound, Matt ended up placing 5th in the tourney and winning $82,000 dollars, with of course, some of my chips. So I decided to dig deeper into Matt Affleck’s poker career. After watching some YouTube videos of his deep runs in back to back World Series Main Events, I felt good to be up against a real time pro with the best of it. Even better, I realized he took a really bad beat as well in the Main Event with much more money on the line and much deeper into the tourney. Not because I wanted to see my revenge feeling realized but because I knew he could empathize completely with what I experienced. As they say all the time, two steps forward and one step back. Time to pick myself up and get prepared for the World Series of Poker Circuit Event which comes to Arizona in February. Until then, Smile Big and Dream Bigger. In case you forgot, one of my main dreams is to become a professional poker player. 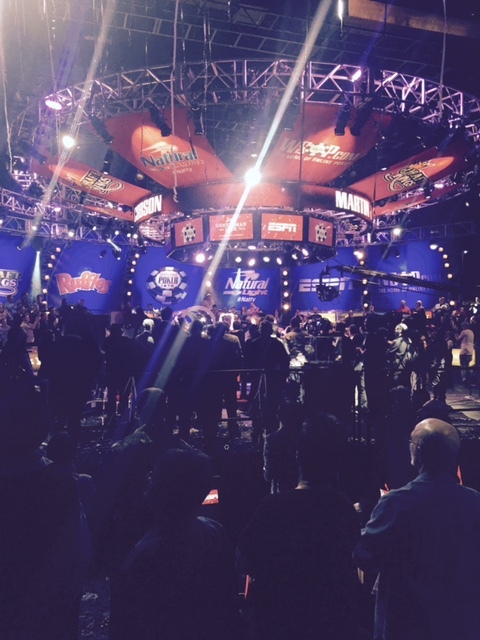 Last weekend I traveled to Las Vegas during the World Series of Poker. Most individuals that don’t really know much about poker don’t realize, depending on the year, there can be up to 60 bracelet events. 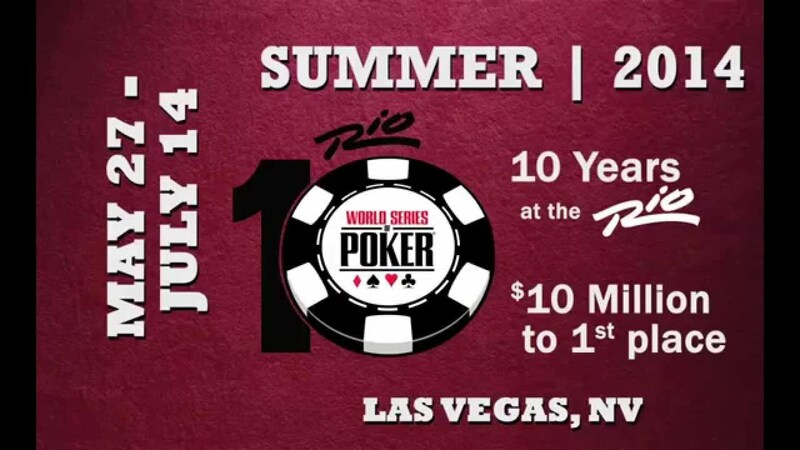 When the layman thinks of the World Series of Poker, the only event that usually comes to mind is the $10,000 Main Event. This year, there are actually 65 bracelet events. For almost all amateur poker players, winning a bracelet event is a lifelong dream. I went to Vegas hoping to fulfill this same dream although I knew it was quite a long shot. My plan for this trip was to win my way into Event #8, which is also known as the “Millionaire Maker Event.” As you can guess, it is titled this because the winner is guaranteed $1 Million. This is one of only three events that the winner will become a millionaire if they are not already. The other two are the “One Drop” which costs a Million Dollars just to enter and the Main Event. You must be thinking, who has a Million Dollars just to enter an event. The top 25 professional poker players in the world, that’s who. The buy in to Event #8 is $1,500. I could have just bought into it as anybody can, but I have not been playing as regularly as I should for somebody who wants to win a World Series of Poker bracelet. Because of this, winning my way in was the plan. Yes, as much as I hate to say it, life sometimes gets in the way of chasing our dreams. For me, this should only be temporary. I flew into Vegas after work on Thursday night and by Friday evening the cash games were not treating me well. I was actually playing okay, but just wasn’t getting the cards and it is hard to bluff unwise amateurs in a low level cash game. So by about 9pm Friday night I only had a few hundred dollars in my bankroll and was worried I wouldn’t have enough funds to finish play a lot more hours without visiting the one machine in Vegas which always pays out… The ATM machine. The Rio has daily deep stack tournaments and at about 9:30pm I decided to enter the 10pm tournament and figured at least I would get a few good hours of play without having to lose more than $135, since that was the entry fee. By 9:50pm I had my entry in hand and was getting prepared for the trite call to “shuffle up and deal.” So there are was, grinding it out and continuing my streak of almost no cards but picking up about 1 big hand every 1.5 hours. Pocket Aces, win a nice pot. Ace King, win a nice pot. Pocket Queens, win a nice pot. Almost 5 hours into the tournament I had a larger than average chip stack and all the players left (about 30) were getting closer to cashing in the event. The event had 204 entries and the top 21 got paid. I wont get into all the gory details but at about 5am, we were still playing and I was at the final table. There were no TV cameras, the poker room of over 200 tables was almost empty due to the late hour, and most of the people in the room were only the staff and a few cash game players. Despite that, to me this was important. I was already guaranteed to make money since the person out in 10th place would get $387 but I was shooting for the $5,306 first prize. This would guarantee my ability to enter the Millionaire Maker event. Like I was running all tournament, I was card dead except for 1 hand an hour. Despite being short stacked, I was able to outlast a few of the big stacks at the final table. Believe it or not, I can’t even remember how I was knocked out of the tournament. Maybe it had to do with the late hour or the multiple games I had played after the tournament since I was in Vegas until Monday afternoon. I was, however, proud to ultimately go out in 5th place and win $1,298. This wasn’t really the big time but I did outlast 200 players. Nobody would know but me, my friends, and my family. The rest of the trip, the games went pretty similar but I did go deep in two other daily events I played. 37th out of 220 at the daily Aria tourney and 328 out of 1560 at the 3pm Rio Daily. So I cashed in 1 of 3 tournaments I entered and for the first time in awhile felt really good about my ability to play solid tournament poker. Tuesday morning, I arrive at work feeling good about my game but realizing nobody else really knew that I cashed. With the exception, of course, of my friends and family. That is until a friend of mine at work, who also plays a lot of poker and knew about my cash, sent me a hyperlink starting with the important http://www.wsop. That’s right, they track and report who cashes in each of the three daily tournaments. And there I was, my 5th place finish listed on a PDF from the WSOP Site that shows the daily winners for May 30th. I felt like Navin R. Johnson from the movie “The Jerk” when he finds out his name is listed for the first time in the phone book. In the wide poker world, I was somebody. To everybody else in means nothing, but to me it definitely means something. It is the first of many upcoming cashes in my poker career. Its the first baby step to living my dream. The cherry on top was when “The Hendon Mob” site also reported out my tournament cash. The Hendon Mob is a group of professional poker players that decided a long time ago to create a poker database of all poker players that have cashed in reportable events. They also keep a running total of each poker players life long earnings. Here I was for the first time, listed on their site with my winning totals. In addition, their database will be tracking me for years to come. Assuming this isn’t my only cash… which it won’t be. I won’t let it be. I won’t stop until playing poker is my main job and I am smiling at the final table with a World Series of Poker bracelet in hand. Until you see me on ESPN… Smile Big and Dream Bigger! I finally did it! I quit my job to pursue my dream! !